Juras Brize is located in a quiet part of Ventspils, only a 5-minute walk from the beach and a 20-minute walk from the center. The rooms offer free Wi-Fi. The bright and modern rooms all feature a TV, a refrigerator, and tea and coffee-making facilities. Latvian specialties and a wide range of drinks are available in the Juras Brize’s elegant cafe. Free parking is available at Juras Brize. The central bus station and the ferry terminal can be reached by car in less than 10 minutes. This modern hotel is located in the heart of Ventspils, just 165 yards from the Olympic Hall and a mile from the beach. The Dzintarjura is the largest hotel in this Baltic Sea port. In addition to comfortable rooms, it features an infrared sauna and a 17-yard indoor pool. At the hotel’s bar and restaurant, you can enjoy a wide range of drinks and a big selection of delicious dishes. The Vilnis is a pleasant 3-star hotel in the north of Ventspils, next to the business center and one mile away from the center. The restaurant serves a wide range of traditional and creative dishes in a pleasant and calm atmosphere. The décor includes a large aquarium. The bar at the Hotel Vilnis serves a wide selection of drinks. Set in a restored 20th-century wood house in central Ventspils, Raibie Logi offers rooms with free Wi-Fi, and free private parking. It is a 10 minute walk from the beach. Rooms at Logi Raibie can accommodate various group sizes. They are tastefully decorated with stylish, country-style decor. Each room is equipped with a modern bathroom and TV. Guests can find restaurants and bars in less than a 10-minute walk from the hotel. There are also on site barbecue facilities and a light and welcoming breakfast room. At Hotel Raibie Logi there is a 24-hour front desk. The staff can also assist with bike rental which is ideal for exploring the Venta River and Livonian Order Castle, located less than 15 minutes from the hotel. Located 650 ft from the Venta River and a 15-minute walk from Ventspils Castle, Hotel Osta offers daily buffet breakfast, a cocktail bar and a sauna. Free Wi-Fi and parking are included. Rooms at Hotel Osta feature hardwood floors and simple furnishings. Each includes a TV, telephone and private bathroom with shower. Regional Latvian specialties and international dishes are served at Osta Hotel’s restaurant. Guests can order wine or beer at the Osta’s bar. The famous Central Beach and Ventspils Olimpiskais Stadions (Ventspils Olympic Stadium) are each 2 miles from Hotel Osta. Only 1000 ft from Ventspils Castle, the Ostmala offers spacious rooms with digital TV and a kitchenette in the historic quarter of Ventspils. The Promenade is just 525 ft away. Rooms at the Ostmala feature ironing facilities and a bathroom with hairdryer. The kitchenettes include a dishwasher, a refrigerator, and a dining area. A storage room for bicycles and cross-country skiing equipment is available at the Ostmala. Located in the city of Ventspils in Latvia’s Kurzeme district, Portoss is a family run guesthouse that offers rooms with flat-screen TV and free Wi-Fi. It provides free private parking spaces. The Portoss is located in a wooden building from 1901. The guesthouse’s simply furnished rooms are done in pastel colours. Each room has a work desk and an electric kettle. The Ventspils central beach and the Venta River waterfront are both within 750 metres. Ventspils castle is 1.1 km away. The aquapark is 250 metres from the Portoss. There is a café on the ground floor of the guesthouse. In the morning a breakfast buffet is available here. The family-run Pulkvedis Guest House is located in a quiet, low buildings area of Ventspils, 550 metres from the Venta River. 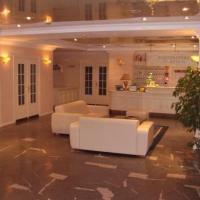 It offers a bathhouse, a common room with a fireplace and bright rooms with satellite TV . All rooms at the Pulkvedis are simply furnished and have wooden floors. Each comes with a private bathroom with a shower. Guests have access to a fully equipped kitchen with a spacious dining room. Free parking and Wi-Fi are available. Pulkvedis Guest House is situated within a 12-minute walk of the centre of Ventspils and its Olympic Sports Centre. City’s central beach is just 3 km away. "Rubini" is located in Parventa, the northern part of Ventspils.This family-run hotel offers apartments with a cable TV, seating area, fireplace and free Wi-Fi. Free private parking and free transfer from the ferry or bus station are available. The Apartment Hotel Rubini are all heated. Each has a kitchenette with a microwave, electric kettle and refrigerator. All apartments have a private bathroom with a shower. Your hosts at the Apartment Hotel Rubini are available 24 hours a day. Barbecue facilities are available for an extra fee. Breakfast is also available. Guests have access to free tea and coffee. Public bus stop is only 50 metres away. Fantazija, children's theme park is a 5-minute walk away. The Ventspils Central beach and the Staldzene steep coastline are both 5-7 minute drive away. Str? ?i is located in the village of Pasiekstes, 1 km from Ventspils. It is a large complex with a main house, a summer house a small chalet. The main house has a several bedrooms and large lounge with a seating area, fireplace and a kitchenette. It includes with a refrigerator and electric kettle. There also is a sauna onsite. Free private parking is available. The rooms of the Str? ?i are spacious, and are done in warm pastel tones. All have a satellite TV and free Wi-Fi. The complex is surrounded by a 1.7 hectare garden. There are barbecue facilities onsite. The Str? ?i also arranges fishing activities. The nearest shop is only a 12 minute walk away. Ventspils Old Town and the beach are a 10 minute car ride away. There is an aqua park within 3 km. These apartments are located in Ventspils, a 10-minute drive from the beach on the Baltic Sea Coast. Apartments Aristokr?ti offer free Wi-Fi and a fully equipped kitchen with electric stove. Apartments at the Aristokr?ti Ventspils feature elegant interiors and wooden floors. All apartments include satellite TV and a washing machine. Guests are welcome to relax in the garden. Barbecue facilities are available on site. A public bus stop can be found just 50 metres from the apartments. The Fant?zija children’s activity park is 500 metres away. On-site parking is free at Apartments Aristokr?ti Ventspils. Rental bicycles are available for exploring the Baltic Coast. 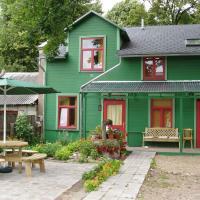 Located in Ventspils, this family-owned guest house offers accommodation with free Wi-Fi and a satellite TV. Free private parking is available on site, and the property provides free tea and coffee. The accommodation offered by the Guest House Podnieki is done either in pastel colours, or feature wooden panelling. All are soundproofed and have a kitchen with a microwave. The private bathrooms all have a hairdryer and a sauna. 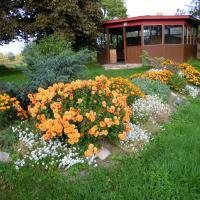 The Guest House Podnieki has an outdoor swimming pool and a sauna. It also arranges horse riding activities and rents bikes. Additionally, guests can enjoy a game of darts. There is a designated barbecue area, and barbecue equipment is offered for rent free of charge. The spacious garden also houses a playground. The nearest bus stop is within 500 metres, and the Ventspils Central Beach and the Staldzene coastline are both 10 minute drive away. 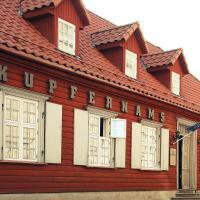 Guest House Kupfernams is located in a historic building, dating back to 1820, in the heart of Ventspils. It offers stylish rooms with hardwood furniture and free Wi-Fi. Each room at the guest house offers satellite TV and a private bathroom with shower. Some offer unique interiors with visible wooden beams. A breakfast buffet can be enjoyed in the restaurant with bare brick walls and leather armchairs. A wide range of cold drinks is served in the bar. Packed lunches and special diet menus are also available. Guests can order professional massage services and enjoy wellness facilities. Bicycle rentals and a ski storage room are offered. Guest House Kupfernams is situated within a 5-minute walk from the Ventspils Livonian Order Castle. The main street is 40 metres away. Located in a quiet area of Ventspils, Holiday House Mazie Broc?ni offers accommodation in a cottage that features free Wi-Fi in rooms as well as free private parking on site. The interiors of the Mazie Broc?ni are bright and elegant. It includes a TV set, a fully equipped kitchen and a private bathroom with a shower. It also has a sauna. The properties garden includes a playground for children, as well as a designated area for barbecues and campfires. The city centre is within 1,6 km, and the nearest bus stop is within 300 metres. The Baltic Sea is within 2.8 km. Villa Leonardo is located only 600 metres from the beach, surrounded by the picturesque Ventspils Seaside Park. 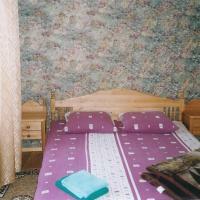 It offers warmly decorated rooms with free Wi-Fi. Each room at Villa Leonardo features a TV with cable channels and a private entrance. The property includes a green garden and bicycle rentals. Guests can use a sauna at an additional surcharge or order a professional massage. Breakfast and other meals can be arranged. There is a kitchen to cook in and the nearest food store 200 metres away. Villa Leonardo has free private parking and a terrace. The nearest bus stop is only 30 metres from the property and there is an open-air aqua park 300 metres away. Veldzes Nams is located 1.6 km from the sandy Baltic beach and offers basic, air-conditioned rooms with free Wi-Fi and private bathroom facilities. Guests can use a sauna at an additional surcharge. Each room at the Veldzes Nams includes basic kitchenware and an electric kettle. There is also an LCD TV and wooden furniture. Guests are welcome to relax in the garden equipped with barbecue facilities. Children can enjoy the playground and there are also bicycle rentals available. The staff will be happy to provide you with tourist information. Veldzes Nams is situated 1.3 km from the town centre. The nearest bus stop is 50 metres away. Situated in a quiet estate in Ventspils, about 850 metres from the Olympic Sports Centre, Guest House Maija offers self-catering accommodation with free Wi-Fi in public areas and private parking. The non-smoking rooms at Maija are bright and feature wooden floors and furniture. Each comes with a TV and heating. A private bathroom is fitted with a shower. There is a kitchenette in every room that includes a microwave, a refrigerator and an electric kettle. Guests can also barbecue outside in the garden. Guests can relax in a sauna that is available at an additional fee. Bicycles can also be rented out. A sandy beach is about 3 km away. Located in a green area a 5-minute walk from the beach and right by the Ventspils Seaside Park and Open Air Museum, Piej?ras Kempings offers accommodation in wooden houses with a private bathroom. The site includes many sport possibilities, along with a volleyball court, a basketball hoop and table tennis facilities. There are also bicycle and bicycle car rentals and a children’s playground. Wi-Fi and a sauna are available at a surcharge. Piej?ras Kempings includes barbecue facilities and offers buffet menus. Packed lunches are available. There is a 24-hour front desk service. In the summer season, a cafe is open in the camping grounds. The camping is situated 2 km from the city centre and 1.5 km from an aqua park. Parking is offered at an additional surcharge. Apartamenti Dzintari offers self-catering accommodation about 1.5 km from a sandy Baltic Sea beach and 500 metres from Ventspils town centre. Free Wi-Fi and private parking are available. The apartment is decorated in various colours and it features wooden floors and patterned wallpapers. There is a TV with satellite channels and a bathroom with a washing machine and a shower. 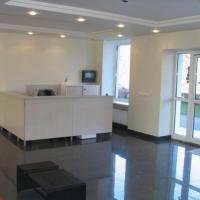 Guests have use of a kitchen which comes with a refrigerator, a microwave and all the necessary kitchenware. Barbecue facilities and a table with chairs are provided in the garden. Swings for children are offered outside and bicycles can be rented out on site. The nearest food shop is just 150 metres away and there is a water amusement park about 1 km from Apartamenti Dzintari. Ventspils Apartments offers private, basically furnished, second-floor studio apartments located in the city centre. It is 1 km from the Ventspils Old Town and the Ventspils Aquapark. The sandy beach is 2 km away. Each apartment has a bathroom with a shower and a kitchenette with a fridge and a stove. Entrance to the apartments is located on the yardside. Free public parking is available. The closest supermarket is about 500 metres from Ventspils Apartments. Arina House is located in the centre of Ventspils. It offers self-catering accommodation and free Wi-Fi access. Both the house and the apartment offer a fully equipped kitchen, a seating area with a TV that has satellite channels, as well as a bathroom with a shower. Towels are available for guests free of charge. Arina House has a spacious garden with a playground that features a trampoline. There are also barbecue facilities and free, private parking space available. Ventspils Olympic Centre is located 250 metres from the apartment, Ventspils Market Square is 1.3 km away, and Castle of Livonian Order is 1.1 km from Arina. Panda Nams is located in the historic part of Ventspils, only a 2-minute walk from the Town Hall Square. It offers basic rooms with free Wi-Fi, a video player and shared or private bathroom facilities. The property has a kitchenette, where guests can prepare meals. There is a cooker, a fridge and a coffee maker. Essential kitchenware is also there. Free tea and coffee, as well as barbecue facilities are provided. Guests can use a washing machine and ironing facilities. There is also a library and an ATM on site. Panda Nams is situated a 5-minute walk from the promenade and a 7-minute walk from the bus station. The ferry harbour is 500 metres away. The sea can be reached in a 10-minute drive. Located close to the town centre and about 850 metres from the sandy beach, Karl?nes Nams offers accommodation with a children’s playground and free private parking. The rooms at Karl?nes Nams are carpeted and bright. There is a TV with satellite channels and a CD player in each of them. A private bathroom has a shower and a hairdryer. Guests can relax in a sauna, a hot tub or sit in the garden where furniture and barbecuing facilities are available. There is a café and a pizzeria at Karl?nes Nams and guests can have their breakfast there too. The bus station is 1.8 km away. 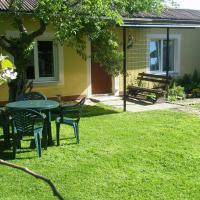 Martas Nams is located 400 metres from the sandy beach, on a quiet street of Ventspils . It offers modernly designed rooms with free Wi-Fi. Every room in Martas Nams is bright and features a TV. Some have a private bathroom, a fridge and an electric kettle. Martas Nams has a garden with barbecue facilities. There is also a sauna and a sun terrace. City centre is located 800 metres away. Amber Coast Villa is located 300 metres from the beach on the Baltic Sea, and offers private accommodation in a house with a fireplace. The house is spacious and bright, with wooden floors and modern furniture. It features a fully equipped kitchen with a dishwasher. There is a flat-screen TV with satellite channels and a DVD player. There are two bathrooms with a shower, free toiletries and hairdryers. The house also boasts a laptop safe. Amber Coast features a garden with barbecue facilities and a children’s playground. There is a sunny terrace, a luggage and ski storage room. Staff of the Amber can arrange for a bicycle or car rental. There is an aqua park 100 metres away from the house. The nearest public transport stop is 300 metres away. Located in the city centre of Ventspils, Arina Apartment is a self-catering unit situated on the 2nd floor. It offers free Wi-Fi, free public parking and a private entrance. 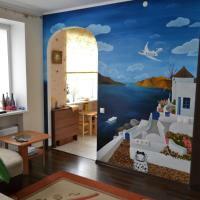 Arina is a bright and tastefully decorated apartment which includes a bedroom and a living room with a colourful mural. There is a flat-screen TV with satellite channels and a bathroom with a bath. This non-smoking apartment offers an express check-in and check-out, as well as car and bicycle rental. It is also possible to receive tourist information on site. Shuttle services are available at an extra fee. Guests at Arina Apartment are welcome to use the kitchen featuring a stove, an oven and essential kitchenware. Other equipment includes a refrigerator and an electric kettle. The property is set 200 metres from the Ventspils' Olympic Centre and 400 metres from the city centre. The beach is 1 km away and the nearest supermarket can be found only 50 metres from the apartment. Situated in Ventspils Old Town, Ventspils City Center Apartment offers view of the Venta River. The apartment features free Wi-Fi, and free public private is available. This spacious apartment features wooden décor complemented by bright colours. Satellite and cable TV is available. The kitchen is well equipped, and the bathroom, accessible from both the bedroom and the living room, comes with a bath. Ventspils City Center Apartment is located 130 metres from the Old Town Square, and 120 metres from the only Latvian digital Planetarium and Observatory. The Bus Station is 500 metres away. Located in a quiet part of port city of Ventspils, 1.5 km from the city centre, Azaida offers simple, bright rooms. Every room in Azaida features shared bathroom facilities. There is a common kitchen and a spacious, common living room, as well as a green garden with barbecue facilities and a bike rental. It is 3 km to Ventspils Bus Station and Ventspils ferry port. Za?ie ?bol?ši is located in the port city of Ventspils and it offers accommodation with free private parking and free Wi-Fi in public areas. The city centre is 5-minute drive away. The rooms at Za?ie ?bol?ši are simple yet functional and they are done in wood. The shared bathroom facilities are situated in the corridor. Breakfast is served at the guest house daily. The nearest food shop is just a 2-minute walk away. Guests can use a sauna at an additional fee and they can also make use of a washing machine. The beach is a 15-minute drive from Za?ie ?bol?ši and Ventspils Adventure Park is a 10-minute drive away. Situated in a quiet area 1 km from the Venta River, Kempings V?nkalni offers accommodation close to nature. There is a 24-hour front desk. The cottages are simply furnished and share access to a common bathroom. Guests at Kempings V?nkalni can relax in the garden which is provided with barbecue facilities and a volleyball field. For children there is a playground with a trampoline. The camping site also features animals such as lambs. There is also an-on site store and a bicycle rental. The city of Ventspils is 5 km from Kempings V?nkalni, and the sea is within 6 km. There is a bus stop 200 metres away. Shuttle services can be provided. Located in a quiet part of Ventspils, Maz? Magnolija offers accommodation with free Wi-Fi and numerous shops and cafes situated in the area. The public beach is a 10-minute drive away. The apartment Maz? 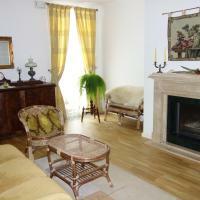 Magnolija is spacious and classically decorated. There is a seating area, a TV with cable channels and a bathroom with a shower and free toiletries. While the apartment features a private kitchen, guests can request meals at an additional fee. There is also a shared kitchen that comes with a stove, a refrigerator and an electric kettle, as well as a seating area. There is a playground for children outside. The apartments are non-smoking and there is a 24-hour front desk.